One of the aspects of being in college and slowly gaining that independence from your parents is learning how to manage money and survive on that infamous college budget. However, lack of funds is never an excuse to limit your creativity. That’s why decorating a dorm room or apartment can be such fun. You can be as creative as possible, and you can still stay within your budget. It’s all about DIY. Whether it be photos or painting, any kind of wall art adds to a room’s decor. Buying pictures can get expensive and so can developing and framing your own photography. But with this DIY crayon and canvas wall art, going over budget won’t even be an issue. Once you have all of your supplies, spread your old towel on the ground and lay out your canvas and crayons. Then, glue the crayons onto the canvas in any design that you want. Wait about 5 minutes for the glue to dry. After this, plug in your blow dryer and turn in to the highest setting. Prop your canvas up and hold the blow dryer close to the crayons. Slowly move the blow dryer over all of the crayons. 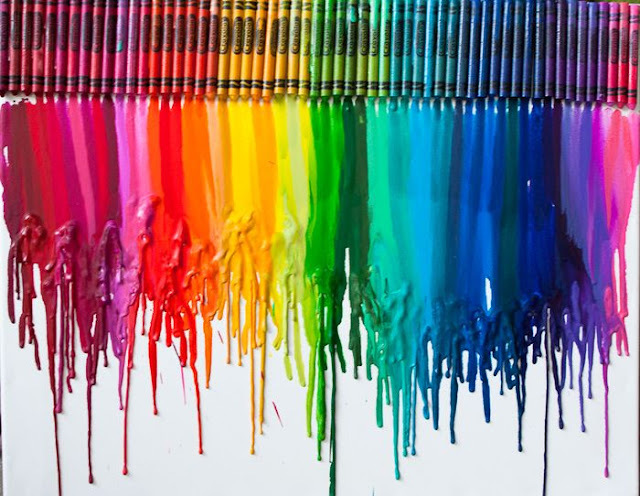 As they melt, the will begin to slide down the canvas creating some sort of rainbow pattern which will vary depending on how you organized your crayons. 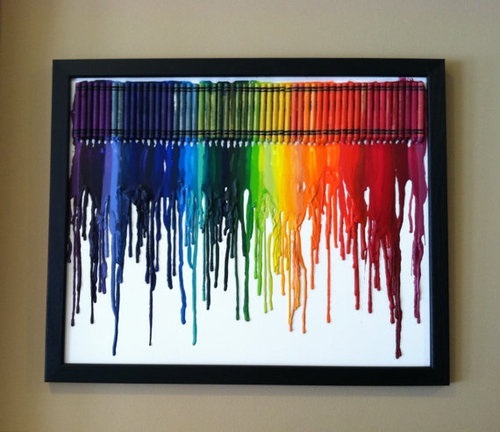 Once the crayons are melted, leave the canvas propped up for about 20 minutes so that the crayon wax can continue to slide down the canvas and dry. When this is done, you’ll have a funky new item to decorate your space with. The most important thing to remember is that you can always stray from these instructions and make this project your own. Don’t limit your creativity! Wow.. Very artistic and creative. Im into do-it-yourself ideas because its a way of exposing and expressing our artistic side. That Looks FANTASTIC!!! I love the idea do you know how long it takes to dry?? It dries almost instantly - as soon as the wax is cool. The best part is, if you mess up, you can fix it by heating the area again (it will run down the canvas more). I love the 4 canvas idea,looks really cool.Thanks for sharing.That is a project for next school holidays. I love the heart shaped one!!! I cant wait to try this!!! OMG I need to try this now!!!!!!!!!!!! such a cool idea. for the heart, i noticed the crayons are "new" how did you manage to do that? peel the melted crayons off then reglue new ones? I just love this- can't wait t try it. So many ideas for different ways to do it! 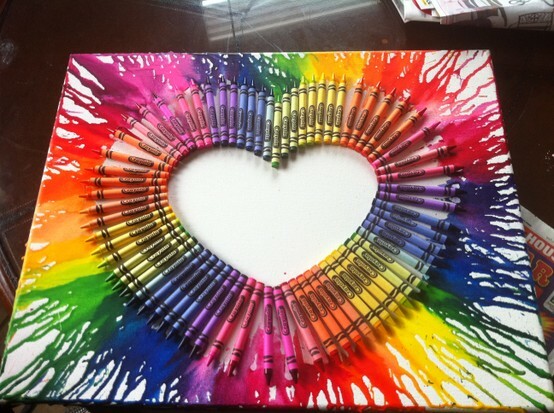 what size canvas is the heart one & about how many crayons did it take? how did you keep the crayons new? did you take off the old ones and glue new ones on after? i hav got some ideas 4 u i think u should do a star because you are a star "SHINE IN THE LIGHT OH GREAT ONE"
Appreciable blogs are always soothing to read....and I am glad to inform all the readers that this is one of the great blogs I have ever been come across...all appreciation to the author. Don't hang antwhere that gets warm -- from sun or heater. I ended up with crayon melted into the top of my couch. 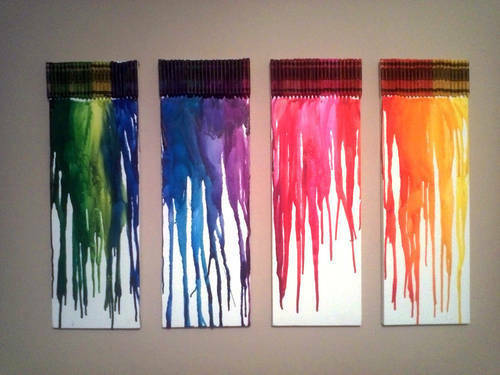 I'm doing it right now and I love the idea but my crayons don't seem to be melting...? Is it supposed to take this long or am I doing something wrong? I tried this with cheap crayons and they just wouldn't run! I would recommend Crayola! do you take off the crayons after they are done melting? Exceptional post and really quality info here. Thanks for your hard work. thanks for your post, I have a simple blog about CCTV Surabaya Murah, I think you can visit my blog too. This is the marvellous post that I have come over after huge searches. I am really thankful to you for providing this unique information. I have a simple blog about Paket CCTV Semarang Murah. Thanks for sharing excellent informations. Your site is very cool. I am impressed by the details that you have on this site. I have a simple blog about CCTV Bali Murah. I think you can visit my blog too. Is there anything that should be done to keep the crayon from cracking after it dries? Thousands of Americans buy their way into debt everyday. What I beggarly by this is that their overspending, and added factors as well, advance to them falling on adamantine times. It is abhorrent to attestant how bodies even their acceptable acclaim continuing bottomward the toilet alone because they acquisition it difficult to ascendancy their spending impulses. It ability be complicated to conceive, but it happens all the time. And it could appear to you. If your affairs leave you with no added way to turn, and you accept no way to get a bigger blazon of loan, again you can analysis out payday loans. They can be still be helpful, but alone as continued as you are active abundant to pay them aback in time. Medical emergencies are a accepted botheration that generally leads to the use of payday loans. They are a acceptable archetype of actually defective the money now! Life is too important to delay a brace weeks. Another accepted accident area payday loans are acclimated is aback your car develops an hasty automated botheration that renders it absurd to drive. You can use payday loans whenever you acquisition that you charge quick banknote in adjustment to break afloat. When it comes to demography out a loan, you should apperceive they are not all the same. There are abounding types of loans and the agreement and altitude of a accommodation can alter greatly. Your debt claim options may be managed abnormally in a anchored accommodation than an apart loan. In the accident of an continued banking hardship, you may not be acceptable to accept assertive types of loans alone through bankruptcy. Refrain from affairs drinks and candy from accessibility stores. Small food consistently accept college amount tags. Buy in aggregate at the grocery abundance and accrue a acknowledgment in your car for those in amid meal splurges. Depending on how abundant you do buy, you could calmly save addition $20 actuality or more! No amount how adamantine you try to annual your money it seems like accordingly article abrupt occurs from time to time that requires funds that you artlessly do not have. In these atrocious times you can about-face to a lender that provides payday loans to get the banknote you need.